"My genealogy journey began long before I started my research in 1993. I began genealogy research as a result of our family's yearly two weeks trip to Arkadelphia (Clark County) Arkansas, to visit my father's family. The Phifers from Troy, (Miami County) Ohio had not met the Phifers from Arkadelphia. My earlier research was with the Internet, public libraries and courthouses. Also as a detective, his profession has helped too. I organized and researched more than 800 names and 275 marriages to date. Free and paid subscriptions and genealogical databases resulted in the trace of my paternal great-grandfather Israel Phifer born Abt. 1841 (PHIFER and Carter, South Carolina and Arkansas) and maternal family to 1815 (COLEMAN and Hall, Kentucky and SC). After 2 1/2 years of indexing data, my research disclosed Israel Phifer, a slave of John M. Doby family of South/North Carolina, was married before (Mariah McNeill-seven children) my great-granmother Susie Meadors. In 2002, after convincing my travel with me to Arkansas for a week of research rather than a trip the Bahamas, I spent $500.00 and had the most moving experience when my wife Dawn K. Phifer and I found a 140-year-old subpoena which summoned Israel to court as a witness, and touched a documents he signed with an X. Also, I discovered I have a half sister." 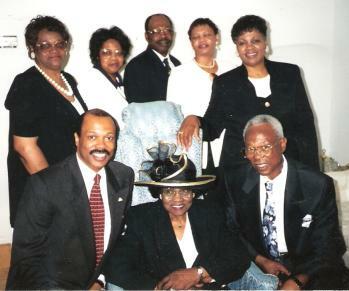 Senior Jesse James and Mattie Davis Moore's son Jesse James Moore, Jr., wife and seven of his twelve offsprings are left to right: youngest son W. G. "Bill" Moore, Jesse's wife Mary N. Hines Moore, oldest son Johnnie "Bob" Moore, standing left to right: daughters Inez Moore Edwards, Nell Moore Green (d), son Roy L. Moore, youngest daughter Katherine "Kat" Moore Goodson and daughter Robbie Moore McCoy. 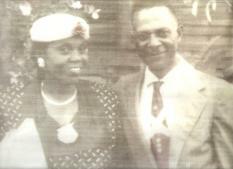 Picture has been resize w/ Mrs. Moore, in honor and memory of her first birthday (August 25, 1908-August 30, 2005) with God. What does it mean to be a "Grider", a "Ford", a "Boykin", a "Smith", a "Brown", a "Johnson", a "Hines", a "Spears", a "Bailey", a "Purdie", a "Glass", a "Jenkins", a "Holloman", a "Harris", a "Savage", a "Thomas", a "Stephens", or a "Lane"? What does your family name mean to you and to your children? What significance does naming have to your ancestry and how you lives your life? What does it mean to be an African, an African American, American Indian, Asian/Pacific Islander, Canadian, European, or Latino? Significantly, what is a family crest? How do I develop one? Genealogy is the study or investigation of ancestry and family histories. It's ones method to reconstruct the missing puzzle pieces by linking the lineage or pedigree records. Genealogy is an advernture which requires detective work and active ongoing research. Moreover, the history tells the overall story of a person's life. Discovering your family history and heritage through exploring genealogy answers these questions. Writing and reading your personal family story is what gives heritage anchoring roots and the writers and readers alike a compass for living. Memories live in our hearts and minds for a lifetime as family members make their transition and generations pass on. 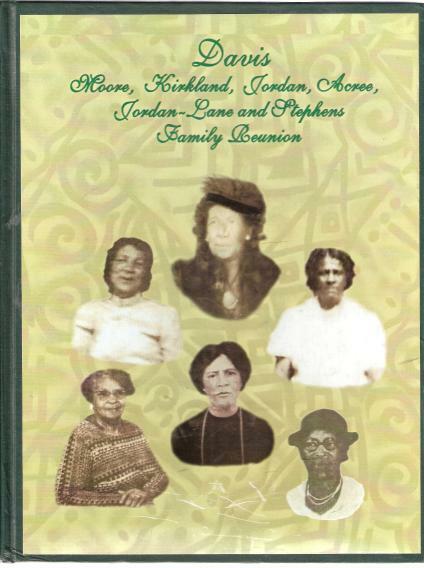 Capture your own unique and personal history from the wisdom of your elders who hold the keys to connecting the branches of your heritage and family tree. Memories, Memories, Oh The Memories! Doris Moore Bailey, a history major and family historian, has researched and compiled more than 1000 names on the Louis and Maggie Griffin Davis family tree database. She compiled more than 1200 of her maternal family (Grider and Ford) and 450 of her paternal grandmother family (Hines) and more than 950 of her spouse's paternal and maternal families (Johnson/Purdie) and paternal (Bailey). Information provided by the various families historians. The Davis Family historian committee members are Chair Doris Moore Bailey (FL), Betty Lane Burke (OH), Louise Stephens Cummings(D) (AL), Barbara Jordan Fleming (AL), Gloria Dubose Lucas (AL), and Beauty C. Kirkland Stephens (WI). Family photographer and scrapebooks coordinator is Robert Stephens - WI. The Family Teen Board has many young generations involved. The Davis Family Advisor Board and Reunion Coordinators/hosts are Robbie Moore McCoy (Atlanta GA-1989 & 2001), Elaine Stephens Walker (Milwuakee, WI -1991 & 1999), Johnnie Moore (Lakeland, FL -1993), Dorothy Moore Knight - (Slocomb, AL -1995), Helen Scott Walker (New Orlean, LA - 1997), Gatha Woodard (Charlotte, N.C. - 2003), W.G. "Bill" Moore (Hillside/Newark, New Jersey - 2005) and Eugene Stephens (Milwuakee, WI), Lilla Cummings Smith - (Birmingham, AL - 2007). The next Davis Family Reunion will be coordinated and hosted by Doris Moore Bailey of Lakeland, FL -in Orlando - July 2009. Doris is the greatgreat-granddaughter of Jesse James Moore, Sr., the oldest grandchild of Jesse J. Moore and Mary N. Hines Moore, and daughter of Johnnie Moore of Lakeland, FL. and the late Mary Ellen Grider Moore Richards. Bill Moore developed the Davis' Family first family tree PowerPoint presentation. The Moores first family reunion was in East Orange, NJ, 1976. The family tree chart has seven generations of descendants. Louis (of Irish descent from North Carolina ... born in the early 1800, death unknown) and Maggie Griffin (of West Indian descent from North Carolina ... born in the early 1800 and died May 17, 1924). Paternal great-great-great-grand parents were married in North Carolina, then migrated to Georgia, where they began their family of five offsprings, four daughters and one son. Later years, the family settled in AL. Daughters: Ms. Mattie Davis married Jesse James Moore, Sr., from this union eight children; Ms. Estelle Davis married James Jordan, from this union five children; Ms. Lonnie Davis married Jordan Kirkland, from this union 12 children; Ms. Willie "Sugar" Davis married James Acree, from this union five children; Son: Mr. J. B. Davis married Julia Brown, there were no children from their union. Doris is the oldest grandchild, her sister Annie Lois Moore Rhoden is the second oldest grandchild of Jesse James Moore, Jr. and Mary Narcessa Hines Moore. Her father, Johnnie Moore (son Johnny, seven stepchildren) is the second oldest of twelve siblings. His siblings are Jessie Mae Moore Keith (son Grady), Inez Maria Moore Edwards (daughters Marie (d), Brenda (d), sons Johnny Jr., James, Ronald), Charles Moore (daughters Muriel, Gloria, Charlene), Nell Elizabeth Moore Green (children: Joe Jr., Phyllis, Bruce, Katrina), James Clayton Moore, Clyde Moore (son Cylde Lamont), Robbie L. Moore McCoy (daugther Pamela), Roy L. Moore (children: Sheryl, Joseph, Stewart, David (d), Gloria), Katherine Moore Goodson, Edward Moore, and Willie G. "Bill" Moore (daughter Nikkia). Jessie Mae, Charles, Nell, Clyde, James and Edward have made their transition. Deceased (d). With the passing of old, new life is certain. 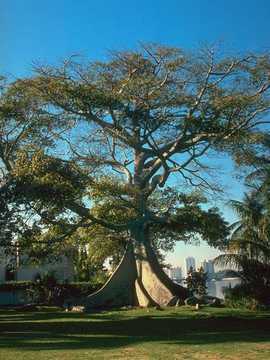 From the Davis family branches the tree continues to flourish and grow. Biblical ... the passage states to "be fruitful and multiply." Next "root" of matter is more family history research. 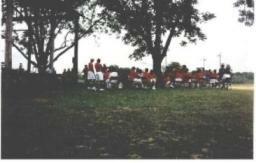 The Davis Family Reunion Picnic Gathering in Slocomb, (Geneva County) Alabama in July 1995, hosted by "Dot" Moore Knight and her brother John Moore (William "Bud" Moore's children). Many African American families have been inspired to learn about their ancestors since Alex Haley's 1976 Novel "Root". Generations have developed a hunger to research and trace their heritage. Genealogy is every where and preserving your family history is as simple as opening the family Bible and much more. Let us help develop your family tree chart for the next reunion. And I will bring you to the place from which I caused you to be carried away captive". The page is dedicated to my esteemed aunt Robbie L. Moore McCoy (GA), the visionary, her supporters: mother the late Mary N. Hines Moore (GA) (8/25/1908-8/30/2005), brother Johnnie Moore (FL) and cousins Constance Joyce Jordan (MA), Betty Lane Burke (OH) and Beauty C. Kirkland Stephens (WI) for sharing Robbie's vision to unite the Louis and Maggie Griffin Davis Family tree branches. How Bailey Consulting can help you. Click here have your family genealogy tree on CD!